We prefer to run residential courses for doctors, nurses and others away from the hospital environment so that they can really commit to the course and not get distracted by bleeps, a quick visit to a patient etc. We have shown that 3 days are more effective than 1.5 days and that optimal group size is 4 per facilitator. Your budget may not run to this but as with everything you get what you pay for and the smaller the numbers of participants and the longer the course the more likelihood there is of seeing some impact. We can often provide suggestions for good venues. The model that we use is learner-centred with participants working on their own specified topics although we know from past experience that areas such as seeking informed consent, dealing with relatives, handling anger and coping with colleagues always crop up. We can structure sessions specifically around these areas or any others you require. The course integrates exercises and activities designed to create simultaneous (in contrast to sequential) skills development, knowledge acquisition, and personal awareness of how these impact on both doctor/nurse and patient. Allowing each participant to define and direct his or her own learning needs and difficulties circumvents defensiveness and renders the work automatically relevant and attractive. Work on specific skills in small groups with standardised patients (trained actors), video review of interviews, and group critique creates a safe and constructive environment when led by highly trained group leaders. Interactive group demonstrations, small group discussion, and selected key readings produce significant gains in conceptual framework and knowledge of the literature. Whenever appropriate, attitudes and personal awareness of communications barriers or emotional responses are discussed and time can also be set aside for this when further group discussion is needed. Because confidentiality of the discussion and proceedings is assured, participants are usually surprisingly frank and direct. Participants are expected to complete comprehensive questionnaires before and after the courses. We provide annotated bibliographies, key communication skills reprints and sometimes videotaped materials appropriate for the group. Course costs will include 2 skilled facilitators per group, 2 actors for 2 half-day sessions plus accommodation and travel expenses which vary depending on the venue. We also have our own AV equipment that may be used for a modest fee depending on the venue. You may also incur charges to hire a venue and for delegate travel and accommodation if you do not have in-house facilities. As requirements may vary please contact us for a bespoke quote. 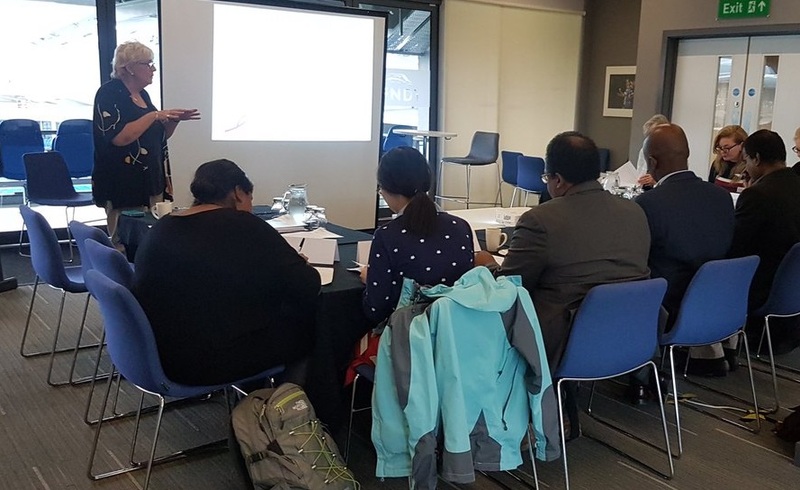 The workshop is aimed at clinicians and nurses treating and caring for breast and/or prostate cancer patients with Metastatic Bone Disease (MBD). The workshop uses a set of 5 newly created educational videos illustrating different MBD consultations. The scenarios do not show the “right” or “wrong” way to discuss MBD but are used as “triggers” to engage participants in discussion. The group workshops are small with a maximum of 10 delegates and facilitated by Professor Dame Lesley Fallowfield. Email adminshore-c@sussex.ac.uk for more information as no workshops are currently scheduled. The basic structure of these is as above but with more emphasis placed on the teaching of skills. We provide doctors with ideas for group exercises and demonstrate how to use simulated (actors) patients. We provide key references for doctors to use, handouts and video materials as part of the package. We will also offer to come back and co-facilitate with any doctor who wishes to teach for the first time and provide them with feedback on their teaching skills. You could cost this out on the figures above, but probably need to consider a charge for the materials. We have always provided these 'free' to date (or got a company to sponsor the photocopying charges and collation) as we've been involved in research and dissemination not profit making. Our preference is for small group work, but we frequently run interactive sessions for large groups, although the venue must be compatible with this. The usual format is for a small amount of didactic work (lecture and video clips) followed by discussion about the groups' key problem areas. We often ask that prospective participants have completed and sent back to us questionnaires probing their primary difficulties so that appropriate video clips and exercises can be selected. The participants will vote on one or more topics on which to focus attention and these can be role-played with a professional actor in front of the group with constructive feedback given. It is helpful if a participant volunteers for this but the facilitator is happy to do an interactive demonstration responding to audience suggestions if participants are reluctant themselves. We run these interactive sessions on a regular basis at the Royal College of Surgeons and the feedback is always very positive. We have also run sessions at large international conferences such as the European School of Haematology. Please email us - adminshore-c@sussex.ac.uk - with any requests or queries.